SILVER SPRING, Md. 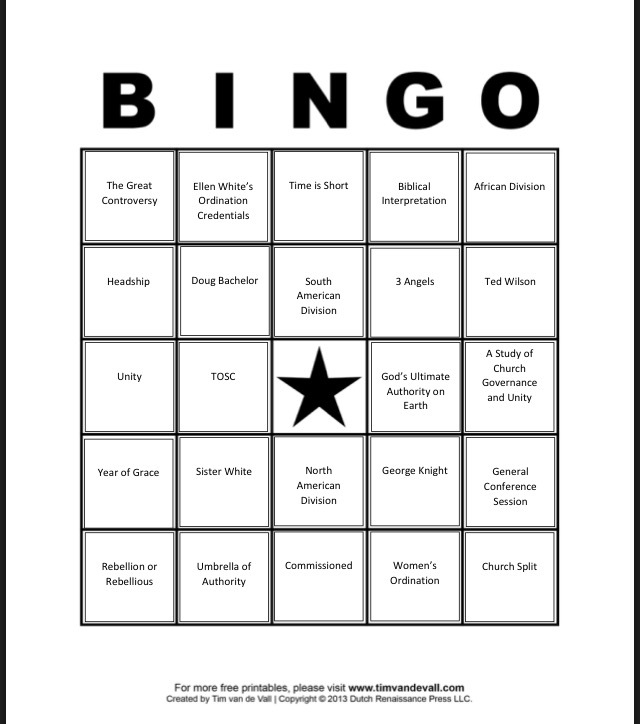 --- In an effort to draw a wider audience for the Annual Council meetings, the GC has released Annual Council Bingo! All attending members were handed a Bingo! card with their welcome packet as they arrived and checked in. To get five in a row, any member just needs to stand up and yell Bingo! as loud as they can during the otherwise dry and boring discussion sessions. In addition, anyone watching the livestream can play along via a downloadable Bingo! card. There will be a number of prizes awarded to those at the Council meetings themselves. The Grand Prize will be one extra vote in the decision about how to discipline the rebellious unions. Special thanks to Lindsey Painter for the guest post. I was hoping that a year’s supply of Little Debbies could be squeezed in here someplace. Or is Little Debbies one of the “promises”? Bingo? That’s putting it mildly. It’s more like a crap shoot.